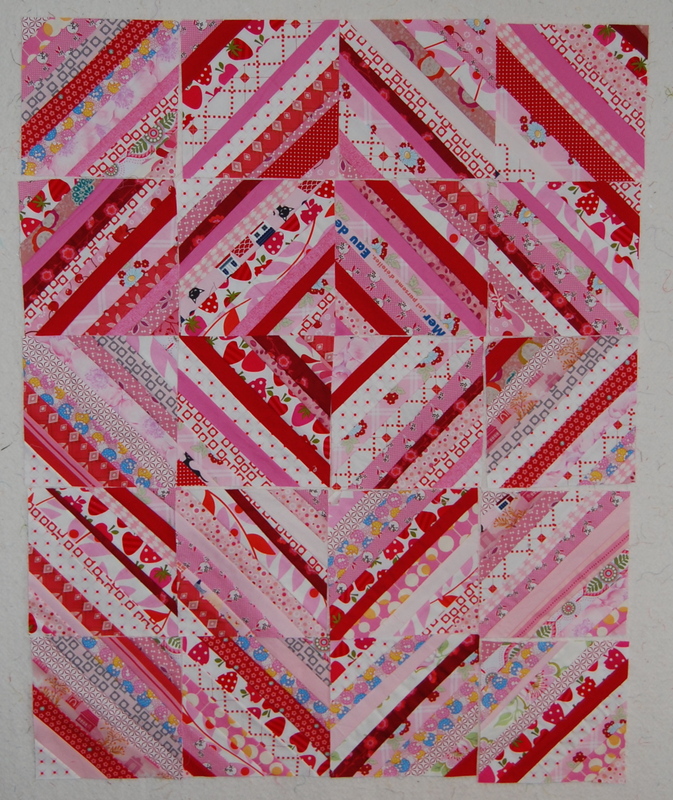 A while back, I had this crazy idea, inspired by my pink loving daughter and Valentine’s Day, to sew together all of our pink fabric scraps to make some kind of string quilt. She helped me gather all the appropriate scraps and glue the middle strip to the paper. I then sewed them together. 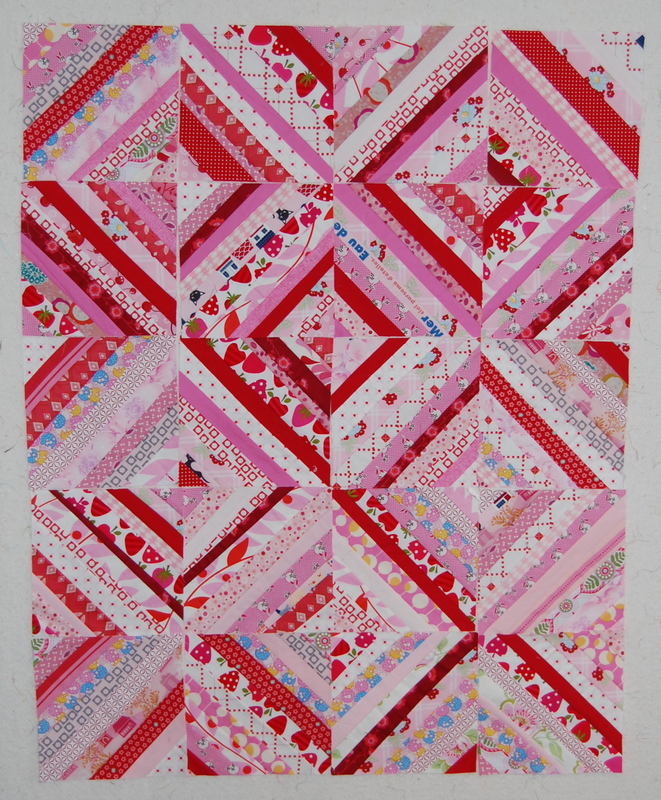 Well, as pink isn’t exactly my favorite color, I finally realized I was having a difficult time embracing this idea of an all pink quilt, even after adding in a bunch of red in hopes of balancing it out a bit. So the little squares had to be put to sleep for a while. 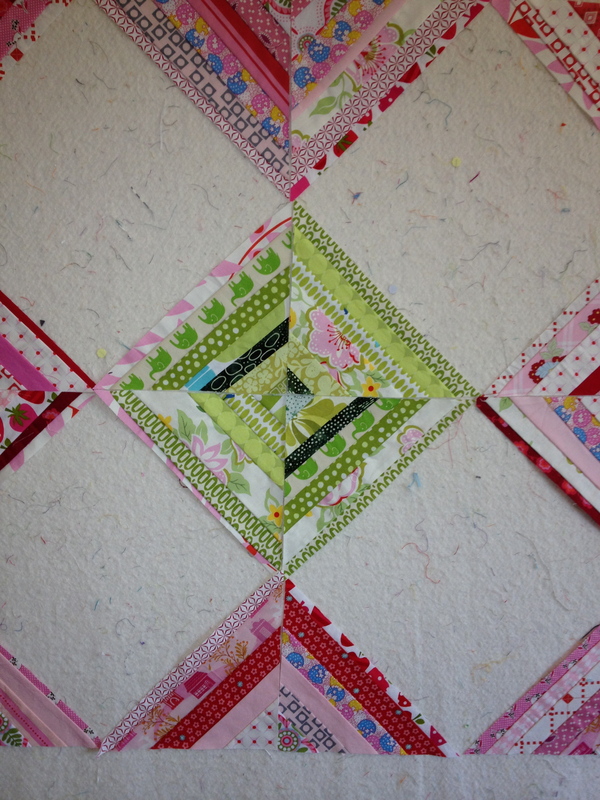 So I set to work figuring out a way to save the little quilt, and decided on a bit of green. I made up a few more squares with some green scraps from my bin, cut them in half- along with the pink ones in order to create a bit of negative space-you probably know what color is going in those center squares right? — here I go again with the white! 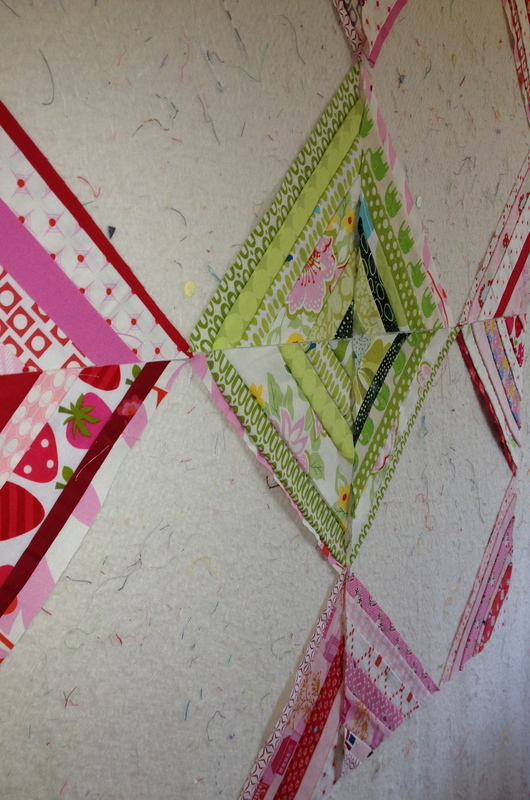 Now we’re pondering just the right layout for this small string quilt. I also had fun playing with my Instagram app on my phone, as my camera is still out of commission. I’ll see what evolves over the weekend with this little quilt. I’m hoping I can put together something fun and save all those block Miss K and I worked so hard on. Now I’m off to figure out how my remote control works so the girls can watch their first ever Olymics Opening Ceremonies!!!! We’re very excited here…… how about you? I can actually see the pink quilt in your second arrangement perhaps surrounded with a lot of white in an offset asymmetrical layout. Whatever you do I’m sure it turn out beautifully. Off to watch the opening ceremonies myself. Enjoy them with your daughters. Funny you should say that; it’s just what I was thinking of doing (I do love the offset placement)before I cut all the squares in half!!! I think in the end though, no matter how I placed it, it felt like too much of a good thing. Thanks for the encouragement!!! I love this color combo. The green with a pop of black just makes it! Looking forward to the finish. I love the green you added! I agree it was to much pink. Can’t wait to see the final quilt! I’m a huge fan of pink I think the quilt is lovely. Just watched the opening of the Olympics. Totally awesome!!! 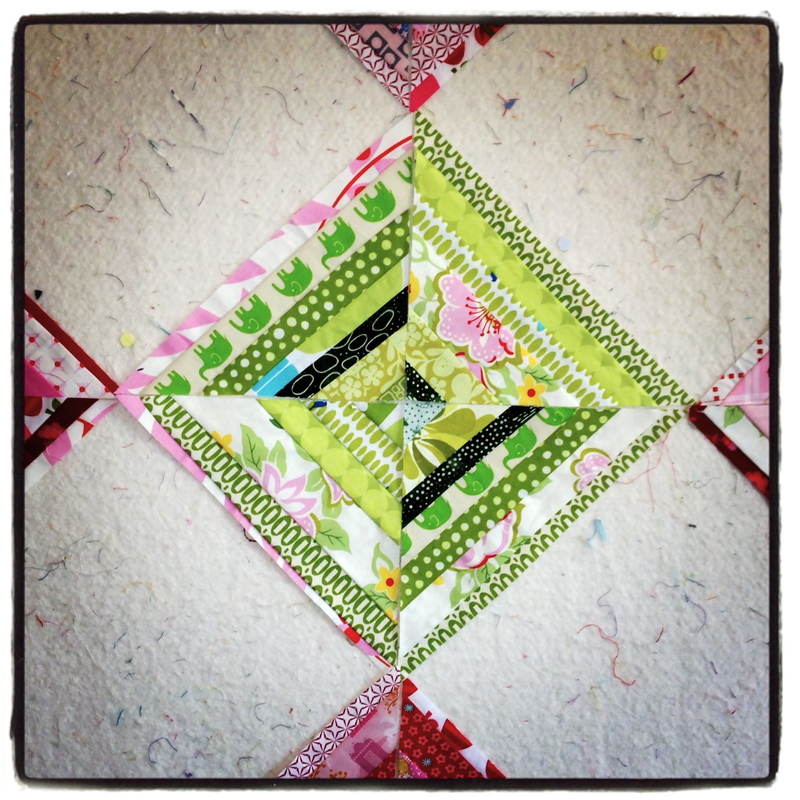 I love string quilts. I really need to make one for myself. I like pink but I don’t love pink. Great idea to add the bit of green. It is nice to see that you are willing to show us that sometimes a design needs to be revised. Looking forward to the finished quilt. Thank you! I like the way you put it– like but not love– me too. And, indeed if you come here often, you’ll see how many times I share my thoughts of revision. That is why I love my design wall so much!! We have to be creatively flexible sometimes, to achieve a piece we love in the end! What a great idea to add the green! Can’t wait to see it come along!